Accountability can be elusive because managers aren’t always clear on what they are looking for. Creating a culture of accountability is an essential job. How to hold employees accountable without micromanaging. How to set and communicate clear, realistic expectations that get done. How to increase professional candor and consistency in the workplace. How to tactfully push "comfort zone" employees who show little drive. How to finally stop talking about accountability and actually cultivate it – without inciting a mutiny. 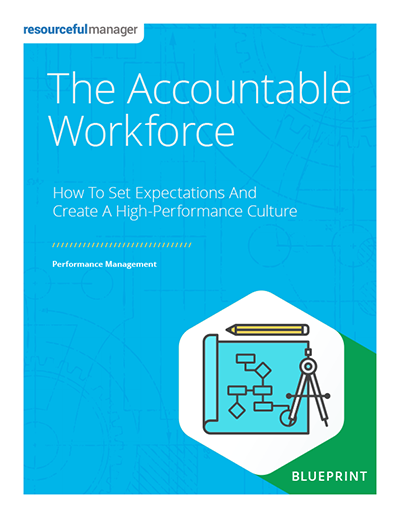 In the long run, a culture of accountability is achieved when expectations for the employee are clearly set at the beginning by the manager, the employee understands the expectations and takes ownership of them. Let's be candid: lack of workplace accountability is manager/executive-made. We are the leaders. We set the direction. We have the authority. We manage the people. It's our responsibility to build accountability in the workplace. ResourcefulManager's "The Accountable Workforce" Blueprint comes with an unconditional, 100% money back guarantee. We're confident you’ll find several new and useful ideas to help you navigate your way to gaining a fully accountable worforce, presented in a practical, easy-to-implement format. If you decide "The Accountable Workforce" Blueprint doesn't deliver value or simply isn't your cup of tea, just email us at contact@resourcefulmanager.com within 90 days, and we'll process your complete, no-hassle refund in 1 business day or less.